When replacing the clutch disc assembly, make sure to perform an inspection of the flywheel sub-assembly and clutch cover assembly. (a) Using a vernier caliper, measure the rivet depth. If the depth is less than the minimum, replace the clutch disc assembly. (b) Using a dial indicator, measure the clutch disc assembly runout. If the runout is more than the maximum, replace the clutch disc assembly. 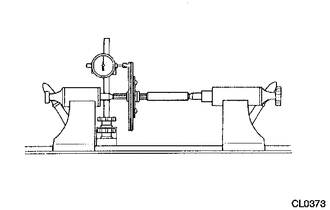 (a) Using a vernier caliper, measure the depth and width of the diaphragm spring wear. 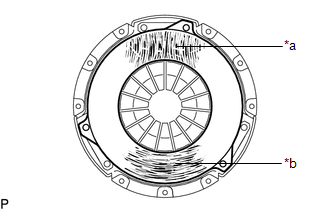 If the depth or width is more than the maximum, replace the clutch cover assembly. 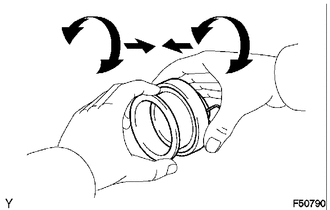 (b) Perform a visual inspection of the clutch cover assembly. (1) Inspect for hair cracks or scratches extending from the center outwards, or discoloration. (2) Inspect for hair cracks in a circular pattern, discoloration or excessive wear. 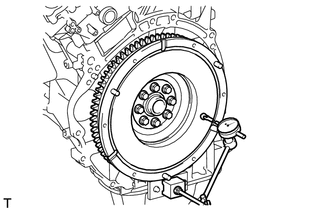 If there is any damage, replace the clutch cover assembly. (a) Using a dial indicator, check the flywheel sub-assembly runout. If the runout is more than the maximum, replace the flywheel sub-assembly. 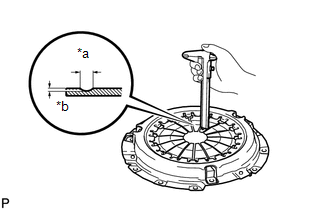 (b) Perform a visual inspection of the flywheel sub-assembly. 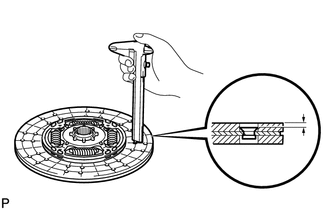 If there is any damage, replace the flywheel sub-assembly. (a) Check that the clutch release bearing assembly moves smoothly without abnormal resistance by turning the sliding parts of the clutch release bearing assembly (contact surfaces with the clutch cover assembly) while applying force in the axial direction. 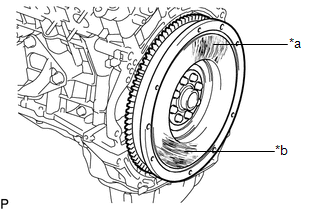 (b) Inspect the clutch release bearing assembly for damage or wear. If necessary, replace the clutch release bearing assembly.